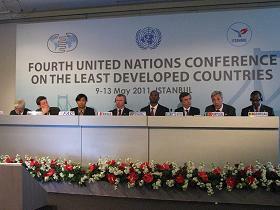 9 May 2011, under the Malian Presidency, the Leading Group continued its advocacy work at the Fourth UN Conference on the Least Developed Countries (in Istanbul). This high-level side event, entitled ‘Innovative financing: helping to achieve the development objectives of the LDCs’ was organised jointly by the Leading Group on Innovative Financing and the United Nations, in the margins of the Fourth UN Conference on the Least Developed Countries. It brought together more than 200 people from different countries (Benin, Brazil, France, Germany, Norway, Portugal, Senegal, Spain), international organisations (World Bank, FAO, African Union, European Commission) and civil society (NGOs, Gates Foundation). During the course of three panel discussions on new sources of financing (panel 1), effectiveness in spending (panel 2) and concrete avenues for action for the LDCs (panel 3), political figures took the floor to remind participants how to give concrete expression to the change in scale announced in Doha in 2008. The conclusion highlighted the need to carry out a review of the existing mechanisms before the plenary session in Bamako (24–25 June). This side event was a true success, in terms of both the numbers attending and the quality of the contributions. It was followed by a press conference. The Permanent Secretariat was tasked with quickly producing a comprehensive summary. Please find the official program of the event and the summary report.